The Honeywell Xenon Series is redefining the standard for handheld scanners. Featuring a custom sensor that is optimized for barcode scanning, the Xenon Series offers industry-leading performance and reliability for a wide variety of applications. The Xenon Series is available in standard and Bluetooth versions. USB Kit. 2D Imager, High-Desnity. Includes USB cable and charging/communications cradle. Color: Black. SCANNER ONLY, 2D Imager, Extended Range Focus. Scan distance is from contact to 2.5'. Cables and accessories must be purchased separately. These include USB (Part# Cable-500-300-S00), PS/2 (Part# Cable-720-300-C00), or RS-232 Serial cables (Part# Cable-020-300-C00) and a Power supply (Part# 46-00525). Color: Black. SCANNER ONLY. 2D Imager, Standard Range, Bluetooth. Color: Black. For the full kit see (Part# 1902GSR-2USB-5). SCANNER ONLY. 2D Imager, High-Density, Bluetooth. Color: Black. For the full kit see (Part# 1902gHD-2USB-5). Non-Cancelable/Non-Returnable. SCANNER ONLY. 2D Imager, Extended Range, Laser Aimer, Bluetooth. Color: Black. Scan distance is from contact to 2.5'. Cables and accessories must be purchased separately. Non-Cancelable/Non-Returnable. SCANNER ONLY. 2D Imager, Extended Range Focus, PDF417, RS-232/USB/Keyboard-Wedge/IBM interfaces. Color: Black. Does not include stand or Scan distance is from contact to 2.5'. Interface cables. Non-Cancelable/Non-Returnable. What I like the most about this scanner is its durability. From the onstart, you can tell how rugged it is and in the long run this can be proved. By M. T. Minogue Inc.
We were very happy with the service from barcodesinc.com. There knowledgeable staff helped us fit up our registers with the proper 2D scanner and cords. We are very happy with the service and the product works great. Only real complaint is the aiming line is a little dim to see in some lighting conditions. Scanner works perfectly for our needs. The scanner is exactly what we needed for our business. I really appreciate Barcodes Inc calling me after I placed my order to make sure I ordered the right product for my needs. They saved me hundreds of dollars!! 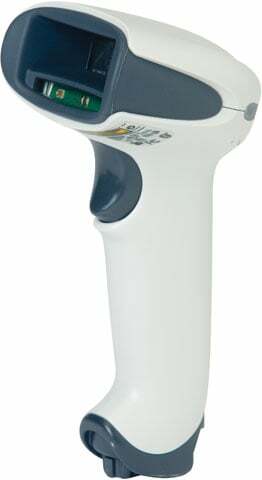 We use the Honeywell Xenon 1900 to scan bar codes on surveys. We have several units in one work space, and we were able to customize the beeps so each workstation is different. The scanners read the bar codes as fast as my operators can present them, sometimes as many as 2,000/hour. There are very few false reads-all of them on code 39 formats. At most we get a false read 1 out of 1,500 records, and it usually is due to an ink smear. Scanning of datamatrix bar codes are flawless. This scanner works great! Easy to use and can be used with a stand or by itself. I have recently had one of my customers start a new beverage store. With the sale of beer and the underage drinking problems in our town this scanner has proven to be an invaluable tool to protect the distributor from the use of fake identification many of our youth try to use today. Just scan the 3d bar code founds on most state identification cards and right away we know if it's fake. It's quick and right away our casher knows. A fine for an underage sale is saved. Great product I would recommend to anyone looking for a great scanner. Work great for reading our barcodes. We scan each barcode in to our data base. Unit plugged into USB. Even an old version of Windows recognized it and set up the text bridge. "Great quality for an excellent price"
Great device with excellent quality and easy installation. Avoid mejor delays on installation with different brands. Usefull on manufacturing and quality control duties. We were pleasantly surprised by the scanner performance reading 2D bar codes. Technical support was quick and effective during initial setup as we needed some level of customization. Price is great as well. This scanner reads just about any label out there, even better than some DPM scanners on the market. It is very fast to decode even damaged or smudged barcodes. Use in Industrial environment and it is very very rugged. It is exposed to Oil and Water mist and it keeps on going. Great range with the bluetooth connection. I have several of them running in this type of environment. Very pleased so far.